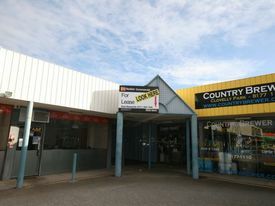 8 Commercial Real Estate & Properties in Clovelly Park are listed in 2 categories. We have 7 OfficesSale & Lease and 1 Retail ShopsSale & Lease . Coworking | Fitted And Furnished | Excellent Amenities $230pw | 4 Person Workspa..
PROPERTY OVERVIEW $230pw Price incl. Internet, Electricity & Outgoings Furnished Workspace Flexi Terms Regular Cleaning 24/7 Access Amazing Clovelly Park Location Modern Fit Out Avail NOW for short or long term rent This coworking centre is an amazing incubator for start ups and entrepreneurs looking for a buzzing atmosphere to run their business from. With a large open plan layout to facilitate collaboration and conversation, this coworking space is perfect for small businesses of any size. The advertised work space is perfect for a team of 4. If you need more or less space we have furnished and unfurnished offices ready to go from 10sqm 200sqm all over Australia and New Zealand. What you get for your weekly rent Furnished or unfurnished workspace Commercial grade internet Electricity usage included Access to shared kitchen facilities Regular cleaning IT support available Photocopying facilities Fair use of meeting rooms and boardrooms Amazing business address to put on our cards Flexible terms from 1 month to long term 24 x 7 access to your workspace 24 x 7 security Office features 24 x 7 air conditioning Office wide wifi Open plan style workspace High speed lifts Shower facilities Dedicated male and female restrooms Tenants can chose between an unfurnished or furnished office space Building features Modern, low level building Bike racks Cafe on site Free street parking available 20m to bus stops 500m to Clovelly Park Train Station 8min to Westfield Marion 20min to Adelaide CBD Close to shops, bars, restaurants & cafes in fact everything! WHO IS OFFICE HUB? Office Hub is Australia & New Zealand\'s No 1 small office space commercial real estate agency. We have the largest collection of shared spaces, coworking and serviced offices in Australia & New Zealand, perfect for 1 100 employees. Let us take you on a tour of all the spaces that fit your needs and budget. Our service is complimentary and we work for you and the landlord to negotiate the most competitive deal in the market. Let us show you how shared and serviced offices can be the perfect solution for your business. www.office hub.com.au www.office hub.co.nz Conditions apply A portion of the square meterage factors in access to shared space. Price includes any incentives offered. This is for new tenants only. Coworking | Fitted And Furnished | Excellent Amenities $115pw | 2 Person Workspa..
PROPERTY OVERVIEW $115pw Price incl. Collaborative coworking space next to Flinders University. Price incl. Rent, internet & Electricity Access to kitchen facilities Access to meeting and boardrooms Cool fitout Dedicated men and ladies bathrooms Flexible terms Furnished with desks and chairs Open plan layout Photocopying facilities Regular cleaning Showers Shared office space Great Clovelly Park location just south of Adelaide This suburban Adelaide co working centre is an amazing incubator for start ups and entrepreneurs looking for a buzzing atmosphere to run their business from. With a large open plan layout to facilitate collaboration and conversation, this cool shared space is perfect for businesses of any size. Part of the modern and innovative Tonsley precinct in Clovelly Park in Adelaide's southern suburbs. The advertised office space is perfect for a team of 2. If you need more or less space, we have over 30,000 furnished workspaces all over the world suitable for a team of 1 to 200+. Our award winning team offer a free service that will help you find the perfect solution for your needs, so reach out if you need more help. What you get for your weekly rent , 24/7 Access , 24/7 Security , Access to internal breakout areas , Access to kitchen facilities , Access to secure printer and scanner , Building outgoings included , Electricity usage included , Flexible terms , Lockable storage unit , One simple bill for everything related to your workspace , Plug and play furnished workspace , Regular cleaning , Secure high speed Internet Building features , Abundance of natural light , Air conditioning , Car parking Street / Public Car Park (Paid) , Disabled access and facilities , End of trip facilities e.g showers, bike racks , Onsite Cafe / Restaurant , Print, scan and copy facilities , Taxi / Uber stand close to building 20m to bus stops 500m to Clovelly Park Train Station 2 minute walk to Flinders University (Tonsley Campus) 20min drive to Adelaide CBD Close to shops, bars, restaurants & cafes in fact everything! WHO IS OFFICE HUB? Office Hub is Australia & New Zealand\'s No 1 small office space commercial real estate agency. We have the largest collection of shared spaces, coworking and serviced offices in Australia & New Zealand, perfect for 1 100 employees. Let us take you on a tour of all the spaces that fit your needs and budget. Our service is complimentary and we work for you and the landlord to negotiate the most competitive deal in the market. Let us show you how shared and serviced offices can be the perfect solution for your business. www.office hub.com.au www.office hub.co.nz Conditions apply A portion of the square meterage factors in access to shared space. Price includes any incentives offered. This is for new tenants only. Coworking | Fitted And Furnished | Excellent Amenities $173pw | 3 Person Workspa..
PROPERTY OVERVIEW $173pw Price incl. Collaborative coworking space next to Flinders University. Price incl. Rent, internet & Electricity Access to kitchen facilities Access to meeting and boardrooms Cool fitout Dedicated men and ladies bathrooms Flexible terms Furnished with desks and chairs Open plan layout Photocopying facilities Regular cleaning Showers Shared office space Great Clovelly Park location just south of Adelaide This suburban Adelaide co working centre is an amazing incubator for start ups and entrepreneurs looking for a buzzing atmosphere to run their business from. With a large open plan layout to facilitate collaboration and conversation, this cool shared space is perfect for businesses of any size. Part of the modern and innovative Tonsley precinct in Clovelly Park in Adelaide's southern suburbs. The advertised office space is perfect for a team of 3. If you need more or less space, we have over 30,000 furnished workspaces all over the world suitable for a team of 1 to 200+. Our award winning team offer a free service that will help you find the perfect solution for your needs, so reach out if you need more help. What you get for your weekly rent , 24/7 Access , 24/7 Security , Access to internal breakout areas , Access to kitchen facilities , Access to secure printer and scanner , Building outgoings included , Electricity usage included , Flexible terms , Lockable storage unit , One simple bill for everything related to your workspace , Plug and play furnished workspace , Regular cleaning , Secure high speed Internet Building features , Abundance of natural light , Air conditioning , Car parking Street / Public Car Park (Paid) , Disabled access and facilities , End of trip facilities e.g showers, bike racks , Onsite Cafe / Restaurant , Print, scan and copy facilities , Taxi / Uber stand close to building 20m to bus stops 500m to Clovelly Park Train Station 2 minute walk to Flinders University (Tonsley Campus) 20min drive to Adelaide CBD Close to shops, bars, restaurants & cafes in fact everything! WHO IS OFFICE HUB? Office Hub is Australia & New Zealand\'s No 1 small office space commercial real estate agency. We have the largest collection of shared spaces, coworking and serviced offices in Australia & New Zealand, perfect for 1 100 employees. Let us take you on a tour of all the spaces that fit your needs and budget. Our service is complimentary and we work for you and the landlord to negotiate the most competitive deal in the market. Let us show you how shared and serviced offices can be the perfect solution for your business. www.office hub.com.au www.office hub.co.nz Conditions apply A portion of the square meterage factors in access to shared space. Price includes any incentives offered. This is for new tenants only. Coworking | Economical Workspace | Excellent Amenities $58pw | 1 Person Workspac..
PROPERTY OVERVIEW $58pw Price incl. Collaborative coworking space next to Flinders University. Price incl. Rent, internet & Electricity Access to kitchen facilities Access to meeting and boardrooms Cool fitout Dedicated men and ladies bathrooms Flexible terms Furnished with desks and chairs Open plan layout Photocopying facilities Regular cleaning Showers Shared office space Great Clovelly Park location just south of Adelaide This suburban Adelaide co working centre is an amazing incubator for start ups and entrepreneurs looking for a buzzing atmosphere to run their business from. With a large open plan layout to facilitate collaboration and conversation, this cool shared space is perfect for businesses of any size. Part of the modern and innovative Tonsley precinct in Clovelly Park in Adelaide's southern suburbs. The advertised office space is perfect for a team of 1. If you need more or less space, we have over 30,000 furnished workspaces all over the world suitable for a team of 1 to 200+. Our award winning team offer a free service that will help you find the perfect solution for your needs, so reach out if you need more help. What you get for your weekly rent , 24/7 Access , 24/7 Security , Access to internal breakout areas , Access to kitchen facilities , Access to secure printer and scanner , Building outgoings included , Electricity usage included , Flexible terms , Lockable storage unit , One simple bill for everything related to your workspace , Plug and play furnished workspace , Regular cleaning , Secure high speed Internet Building features , Abundance of natural light , Air conditioning , Car parking Street / Public Car Park (Paid) , Disabled access and facilities , End of trip facilities e.g showers, bike racks , Onsite Cafe / Restaurant , Print, scan and copy facilities , Taxi / Uber stand close to building 20m to bus stops 500m to Clovelly Park Train Station 2 minute walk to Flinders University (Tonsley Campus) 20min drive to Adelaide CBD Close to shops, bars, restaurants & cafes in fact everything! WHO IS OFFICE HUB? Office Hub is Australia & New Zealand\'s No 1 small office space commercial real estate agency. We have the largest collection of shared spaces, coworking and serviced offices in Australia & New Zealand, perfect for 1 100 employees. Let us take you on a tour of all the spaces that fit your needs and budget. Our service is complimentary and we work for you and the landlord to negotiate the most competitive deal in the market. Let us show you how shared and serviced offices can be the perfect solution for your business. www.office hub.com.au www.office hub.co.nz Conditions apply A portion of the square meterage factors in access to shared space. Price includes any incentives offered. This is for new tenants only.